Nålebinding is one of the oldest forms of meshing yarns, and is a precursor to modern knitting and crochet. The naalbinding technique has been used as far back as the Paleolithic period. Nalbound items include a great variety of knitted fabrics from fishing nets have been found dating back to 6500BC, hats in the Tarim Basin, China dating 1000BC, and socks in Ancient Egypt dating from 600-400BC. While in modern times the craft of nalbinding is most often practised in Finland, it is more commonly associated with the Vikings. I have concentrated on the mid-to-late Viking era, from around 800AD to 1100AD. While fabric and clothing in archaeology is rare due to the fragile nature and organic materials involved, there are a number of archaeological finds from across the Viking empire which support the use of nalbinding in various articles of clothing. The map and table below show the sites at which nalbinding items have been found. The blue dots represent Mammen Stitch, red dots represent York Stitch, black dots Oslo Stitch and the pink dot represents various stitches found. Whilst over 30 different nalbinding stitches exist, the evidence from grave sites suggest the Vikings only used three stitch types, and within these stitch types there is also geographical preference. Southern Sweden, Denmark and Southern Finland were all under control of the Danes, who from the archaeology seem to predominantly use Mammen Stitch. Whereas the Norse Vikings seem to predominantly use Oslo Stitch. Birka appears to be an anomaly where various types of nalbinding stitch were uncovered. 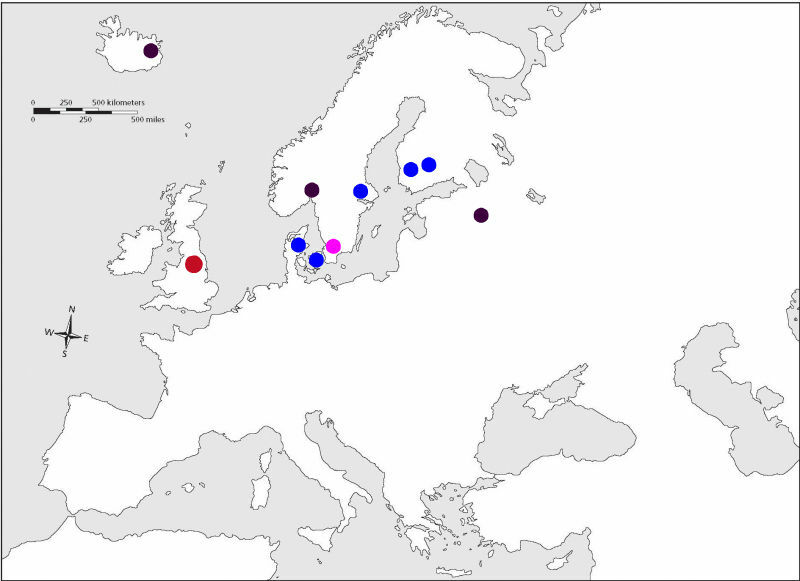 This may be due to Birka's location as a main trading centre between Scandanavia, Eastern Europe and the Orient. York too appears as an anomaly, and the only location where York Stitch has been found. York was over the period from 866AD to 900AD was interchangeably under the rule of both Norse and Danish Vikings, and influenced by the Saxons, so it not unreasonable to suggest this mix of influences gave rise to a new form of nalbinding stitch. However the sample of grave sites is too small to give a definitive conclusion. The archaeology has uncovered a variety of different materials used to produce the nalbinding fabrics. The majority is produced from wool, there are variances in single spun and plied wool yarns, S-spun and Z-spun. It suggests that the materials used were both dependent upon the quality and type of wool available, the environment, and social influences on way in which the wool was spun. The mittens from Iceland for instance were made from coarse, plied wool suggesting the sheep on Iceland at this time were long maturing breeds that had small demands, which suited the harsh Icelandic environment. However we can see that although nalbinding was used to make functional clothing such as mittens and socks to combat the cold winters, it was also used for decoration as seen in the finds at both Birka and Bjerringhøj.